Dr. Tina Wu is currently the Ronald O. Perelman Department of Emergency Medicine Associate Chief of Service and Director of Quality Improvement. Tina was previously the Chief of Service for the Immediate Care Center at the NYU Hospital for Joint Diseases. She received a Bachelor of Science degree in Molecular and Cellular Biology and a Bachelor of Arts degree in Psychology from the University of Arizona. 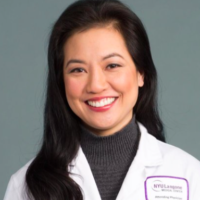 Tina attended medical school at UCLA and completed her residency in the Emergency Medicine program at NYU Langone Medical Center/Bellevue Hospital Center. Tina also received her MBA degree from Harvard Business School, completed a Global Health Fellowship with the American Medical Student Association in Washington DC, and a National Security Education Fellowship in Beijing, China. Previously, Tina worked as the Assistant to the Medical Director at the Los Angeles County Department of Health Service and served as Director of the AMSA National Global Health Scholars Program. She co-founded a non-profit organization, Support for International Change, in Arusha, Tanzania. Within Emergency Medicine, Tina is interested in operations, supply chain management, and education. She has lectured at over 30 hospitals and medical schools. Married to a toxicologist, Vince, and mother to a toddler, Dean, Tina spends her free time chasing after Dean and fishing inedible objects out of his mouth.